Application: 1 Kraftform bitholding screwdriver 816 R with Rapidaptor quick-release chuck, 1 universal bit holder 889/4 1 K Rapidaptor. Design: Hard plastic case, 32-piece set. The tools can be stored and carried in a hard plastic case for easy tool access. The 05057111001 Wera Kraftform Kompakt 71 Security - 32 Piece Set is one of thousands of quality tooling products available from MRO Tools. 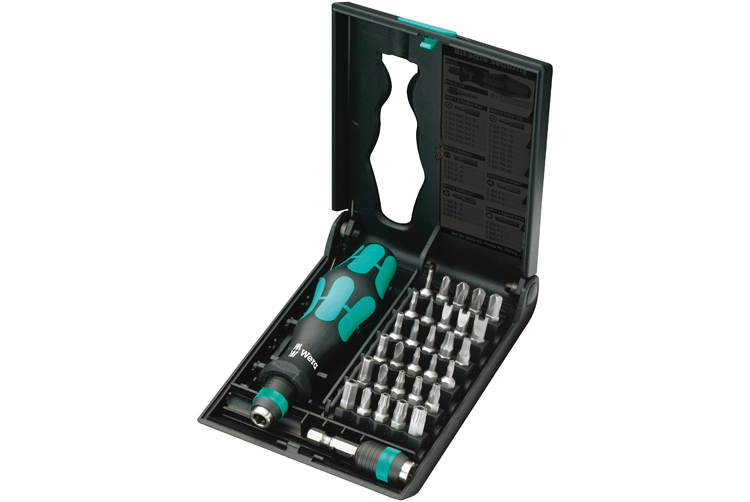 Please browse Wera Kraftform Kompakt and VDE Sets for tools similar to the 05057111001 Wera Kraftform Kompakt 71 Security - 32 Piece Set. 05057111001 Wera Kraftform Kompakt 71 Security - 32 Piece Set description summary: Wera Kraftform Kompakt 71 Security - 32 Piece Set. Rapidaptor bit holder with quick release chuck for rapid bit changes will hold both inset and power drive bits. Kit comes complete with a hard plastic case for easy tool access. Quantity discounts may be available for the 05057111001 Wera Kraftform Kompakt 71 Security - 32 Piece Set. Please contact MRO Tools for details.